Google Slides is arguably the leading free slideshow presentation app. Microsoft PowerPoint is more feature-rich, but the excessive cost of an Office 365 subscription Office 365 vs. Office 2016: Which Is Cheaper in the Long Run? Office 365 vs. Office 2016: Which Is Cheaper in the Long Run? Contrary to popular belief, Office 365 is not a greed-driven move to make more money. Office 2016 and Office 365 serve different audiences. We'll show you which one is better value for you. Read More means many people have converted to Google’s product. So, if Google Slides forms an important part of your daily workflow, keep reading. We’re going to introduce you to four quick tricks that’ll instantly turn you into a power user. If you like to create beautiful, artistic slides, you might need to focus on one part of a slide in more detail. It’s easy to do. To zoom in, press Control + Shift + Plus. To zoom out, press Control + Shift + Minus. Are you working on a long presentation? It’s no fun to spend all day typing. Why not try dictating your slides instead? To dictate a slide, go to Tools > Voice type speaker notes. It will bring up a small microphone icon on your screen. Click on it and start talking. It’s relatively straightforward to add images and videos to one of your slides, but what about audio? There’s no “Insert” button for audio in the same way as there is for other media. The solution? Just copy and paste the URL of a YouTube video, Spotify song, or other online audio track. The sound will start playing when the slide in question pops up. Who needs HDMI cables these days? As long as you take a Chromecast with you, you present directly from your computer to the screen without a cable in sight. Go to Present > Present on another screen to get started. If you’d like to learn more, we’ve got you covered. 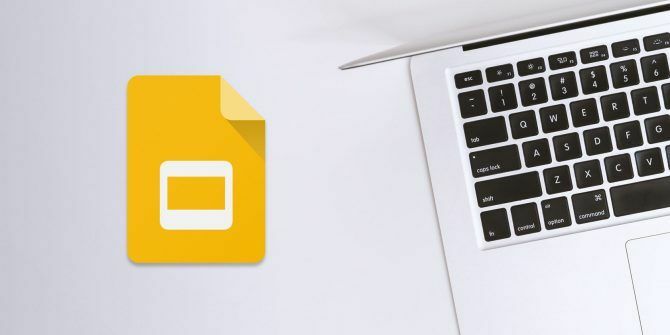 We’ve given you tips on how to use videos in the Google Slides app 4 Essential Tips When Using Videos in Google Slides 4 Essential Tips When Using Videos in Google Slides It isn't enough to just dump videos in a slide and call it a day. The best presenters know these nifty video tricks when using Google Slides. Read More , explained how to auto-loop presentations Yes, You Can Auto-Loop Google Slides Presentations Yes, You Can Auto-Loop Google Slides Presentations Google Slides is a great for creating slideshows, but the option to loop presentations isn't easy to find. Here's how to enable it. Read More , and a whole lot more. CTRL+SHIFT+PLUS and the MINUS doesn't work on a Windows 10, Google Chrome browser. CTRL+PLUS tries to zoom in using the Google Chrome functionality but the presentation is not affected by the zoom.